At sixteen Anne is grown up...almost. 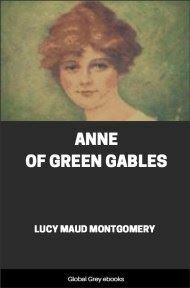 In the years since she arrived at Green Gables, she has earned the love of the people of Avonlea and a reputation for getting into scrapes. But when Anne begins her job a the new schoolteacher, the real test of her character begins. Along with teaching the three Rs, she is learning how complicated life can be when she meddles in someone else's romance, and she also wonders about the strange behaviour of the very handsome Gilbert Blythe. A tall, slim girl, "half-past sixteen," with serious gray eyes and hair which her friends called auburn, had sat down on the broad red sandstone doorstep of a Prince Edward Island farmhouse one ripe afternoon in August, firmly resolved to construe so many lines of Virgil. But an August afternoon, with blue hazes scarfing the harvest slopes, little winds whispering elfishly in the poplars, and a dancing slendor of red poppies outflaming against the dark coppice of young firs in a corner of the cherry orchard, was fitter for dreams than dead languages. The Virgil soon slipped unheeded to the ground, and Anne, her chin propped on her clasped hands, and her eyes on the splendid mass of fluffy clouds that were heaping up just over Mr. J. A. Harrison's house like a great white mountain, was far away in a delicious world where a certain schoolteacher was doing a wonderful work, shaping the destinies of future statesmen, and inspiring youthful minds and hearts with high and lofty ambitions. To be sure, if you came down to harsh facts . 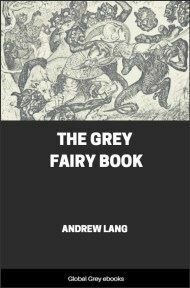 . . which, it must be confessed, Anne seldom did until she had to . . . it did not seem likely that there was much promising material for celebrities in Avonlea school; but you could never tell what might happen if a teacher used her influence for good. Anne had certain rose-tinted ideals of what a teacher might accomplish if she only went the right way about it; and she was in the midst of a delightful scene, forty years hence, with a famous personage . 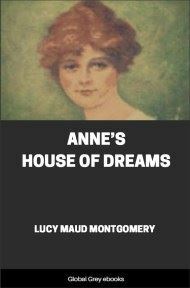 . . just exactly what he was to be famous for was left in convenient haziness, but Anne thought it would be rather nice to have him a college president or a Canadian premier . . . bowing low over her wrinkled hand and assuring her that it was she who had first kindled his ambition, and that all his success in life was due to the lessons she had instilled so long ago in Avonlea school. This pleasant vision was shattered by a most unpleasant interruption. A demure little Jersey cow came scuttling down the lane and five seconds later Mr. Harrison arrived . . . if "arrived" be not too mild a term to describe the manner of his irruption into the yard. He bounced over the fence without waiting to open the gate, and angrily confronted astonished Anne, who had risen to her feet and stood looking at him in some bewilderment. Mr. Harrison was their new righthand neighbor and she had never met him before, although she had seen him once or twice. In early April, before Anne had come home from Queen's, Mr. Robert Bell, whose farm adjoined the Cuthbert place on the west, had sold out and moved to Charlottetown. His farm had been bought by a certain Mr. J. A. Harrison, whose name, and the fact that he was a New Brunswick man, were all that was known about him. But before he had been a month in Avonlea he had won the reputation of being an odd person . . . "a crank," Mrs. Rachel Lynde said. Mrs. Rachel was an outspoken lady, as those of you who may have already made her acquaintance will remember. Mr. Harrison was certainly different from other people . . . and that is the essential characteristic of a crank, as everybody knows. In the first place he kept house for himself and had publicly stated that he wanted no fools of women around his diggings. Feminine Avonlea took its revenge by the gruesome tales it related about his house-keeping and cooking. He had hired little John Henry Carter of White Sands and John Henry started the stories. For one thing, there was never any stated time for meals in the Harrison establishment. Mr. Harrison "got a bite" when he felt hungry, and if John Henry were around at the time, he came in for a share, but if he were not, he had to wait until Mr. Harrison's next hungry spell. John Henry mournfully averred that he would have starved to death if it wasn't that he got home on Sundays and got a good filling up, and that his mother always gave him a basket of "grub" to take back with him on Monday mornings. As for washing dishes, Mr. Harrison never made any pretence of doing it unless a rainy Sunday came. Then he went to work and washed them all at once in the rainwater hogshead, and left them to drain dry. Again, Mr. Harrison was "close." When he was asked to subscribe to the Rev. Mr. Allan's salary he said he'd wait and see how many dollars' worth of good he got out of his preaching first . . . he didn't believe in buying a pig in a poke. And when Mrs. Lynde went to ask for a contribution to missions . . . and incidentally to see the inside of the house . . . he told her there were more heathens among the old woman gossips in Avonlea than anywhere else he knew of, and he'd cheerfully contribute to a mission for Christianizing them if she'd undertake it. Mrs. Rachel got herself away and said it was a mercy poor Mrs. Robert Bell was safe in her grave, for it would have broken her heart to see the state of her house in which she used to take so much pride.